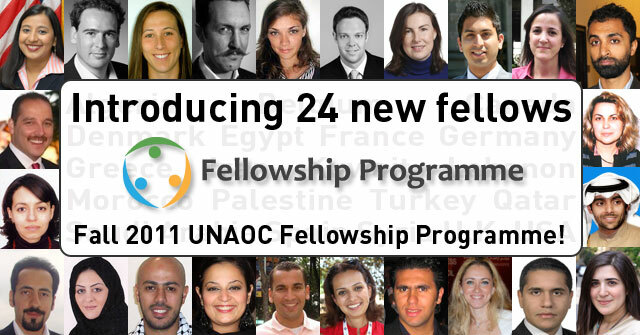 Fellowship News: Announcing 24 new fellows for the Fall 2011 UNAOC Fellowship Programme! This year, the United Nations Alliance of Civilizations will hold the 2nd edition of its Fellowship Programme for emerging leaders from the US, Europe and the Arab World. Developed in partnership with the British Council, the League of Arab States, ISESCO, the Institute for International Education, and the Qatar Committee for the Alliance of Civilization, the fellowship programme’s aim is to enhance mutual knowledge and understanding between peoples and societies from Muslim-majority countries in the Arab World, Europe and North America. It provides fellows the opportunity to travel throughout three countries in Europe and three states in the US, and emerging leaders from the US and Europe to three countries throughout the Arab world. On the US/ European side, the program is held in New York, Washington DC, Philadelphia, Paris, Brussels and London for a period of two weeks and offers young leaders some meetings and visits in the host country with decision makers, media leaders, local communities, grassroots, religious groups for in depth discussions.The program will run from September 10 to 26 2011and will feature 12 fellows (men and women) from 26 to 38 years old from Syria, Libya, Algeria, Morocco, Egypt, Saudi Arabia, Palestine, Kuwait, Qatar and Lebanon. The recent events of the Arab Spring and the current events have highlighted the emergence of a new generation of leaders, their aspiration for exchanges with the rest of the world and the need to develop exchange programs among emerging leaders from different parts of the world. Please follow us on facebook to follow us on this unique experience as we will be posting news, stories, and pictures throughout these trips! FOLLOW THE STORIES ON OUR BLOG! For more information on the fellowship please click here.